I'm teaching and practicing Taichi for 7 years now. I'm a friend of the Vice-Abbot Shi Yong Di, from the Shaolin Temple. I can arrange for you to study with the best teachers from his shaolin kungfu school. You can study, shaolin kungfu, taichi, qi-gong, meditation and much more. If you want go with me to Shaolin, please you conact me, I will answer you soon, I promise. 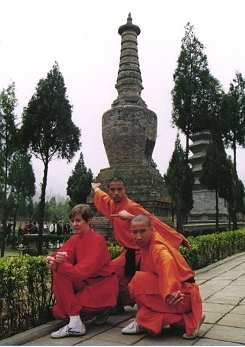 You can see the dates for the next shaolin trip on my "Shaolin Trips" page. I practise two Taichi styles. Wu style and Yang style. It is also possible that I teach you Taichi in Shaolin. My Taichi has caused very positive results to many students and I'm sure I can help you as well. My Taichi form is something special because I maintain a feeling of unity with the old masters, and, if you'd like, then you can feel this very positive effect, too. I won the bronce medal of Taichi in Genf Swiss Juny 2001. Please visit also my Jet Li page. You can contact me here. I'm waiting for you!! !